Product Description: This Cotton compression bra features adjustable Velcro shoulder straps, constructed of cotton and Lycra spandex with front Velcro closure. Tank style back promotes maximum support and stability with confront raiser back design. Benefits: When applied correctly, the garment will increase blood circulation around the surgical area where a breast augmentation, breast implant, mastectomy, or lumpectomy has been performed. 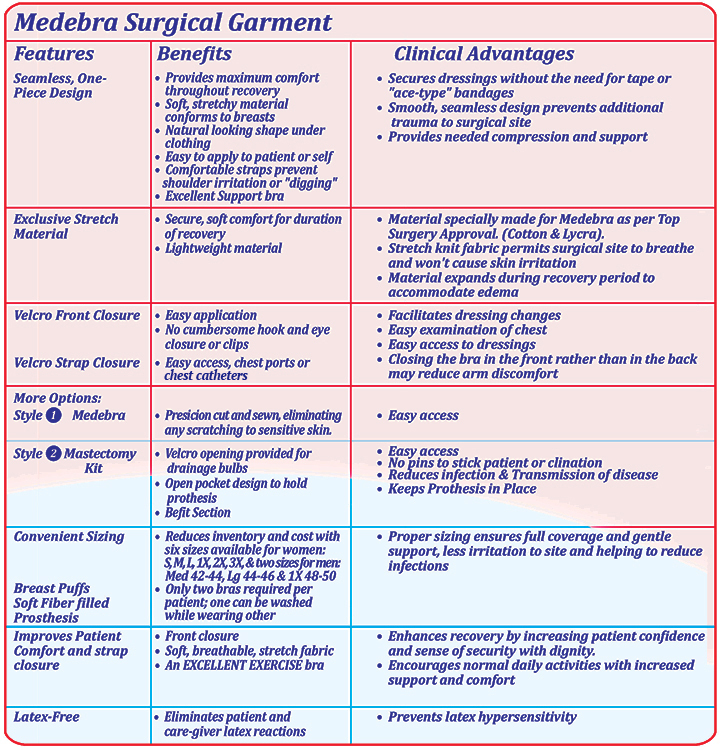 The Medebra surgical garment will also accelerate the healing process, diminish swelling, and flush out any harmful bodily fluid from the specific area. 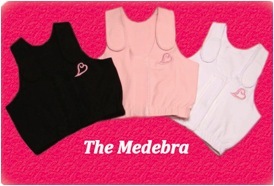 In the event of a sudden movement (Example: sneeze or cough), the Medebra garments control will minimize the discomfort. offers the soft support and compression patients need immediately following breast surgery. Soft, breathable fabric stretches to accommodate edema without binding or irritating sensitive tissue. A front Velcro-type closure facilitates inspection of the surgical site and dressing changes. Instructions: Wrap compression bra around the upper torso and attach Velcro shoulder strap , special design for chest ports and chest catheters for less irritation at site. Consider Buying Two: As it is important to have constant pressure applied on the target area, consider purchasing two compression garments so that you will always have a clean one to wear while washing the other. The more time in a compression garment, the better the results. Care: It is recommended that the garment be hand washed with mild soft soap, cold-water, line-dry. Material: Cotton/Lycra, Flexible & Breathable, GARMENT IS 100% LATEX FREE….Made in the USA…. And a touch of feminity and dignity. International Hospitals Top Surgeons approvals have been given. Multi purpose patient approvals. Samples are provided for clinical evaluation or trial.